Accessing your accounts from anywhere should be easy and secure. The First State mobile banking app gives you 24/7 account access in the palm of your hand. Deposit checks using your smartphone’s camera with Mobile Deposit! Simply take photos of the front and back of your check and deposit it directly into the account of your choosing. Funds will be available the next business day, as long as the deposit is made before 5:00 p.m. Your deposit will show as pending until it is posted to your account. You can review the transaction’s status at any time within the Mobile Banking App by viewing your Deposit History. 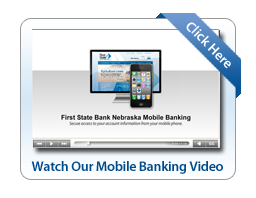 Using your device’s mobile web browser, you can go to the First State Bank Nebraska website to log in to your online banking profile just as you would on a desktop or laptop computer. Once you’re logged in, you’ll be able to enjoy all the features of Online Banking.